The construction of All Saints Church was begun in 1858 and it opened in 1861. It is a gothic revival building­ designed for Anglo-catholic worship. Building continued for almost 30 years and today All Saints is still not ·complete. A tower has never been built and most of the carving of capitals of pillars and elsewhere remains to be executed. However All Saints church is one of the most significant gothic revival churches in Australia. It is the biggest parish church in Australia with a seating capacity of up to 1400 people. As you enter the church, the Baptistry, Screen and War Memorial are the first places of particular interest. The war memorial on the left is in memory of men of the parish who died in WWI. The screen is also a war memorial. The names of those who served in both world wars are listed on the screen. On the right, the baptistry is one of few in Anglican churches in Australia. Its placement signifies that we enter the church at our baptism. The stone font is surmounted by an elaborate font cover. The Nave, where the people sit, presently has seating for 800 people. Throughout the church there are many beautiful stained glass windows all of them well worth close inspection. The large windows in the nave are by various artists. Of particular interest is the large rear window - a Judas Window. There are few representations of Judas Iscariot in churches. This is thought to be the only Judas window in Australia. The North and South Transepts are particularly beautiful spaces. They have 10 beautiful windows depicting scenes from Our Lords life. In the south transept a Rood called the "Cowley Rood'' is to be seen. 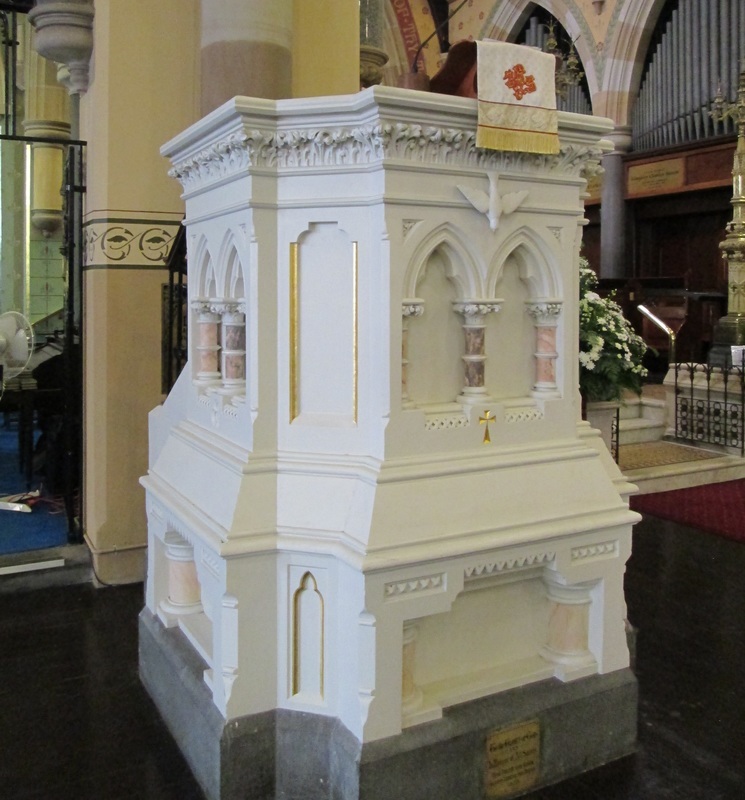 Several other works of interest and a model of the church made by the original architect lie in the transepts. The enormous rood came from the Nuffield Motor Factory Chapel at Cowley in England. The factory is no more and the chapel is now an archives building. Outside the chancel, the Pulpit is a beautiful piece of carving and its prominence emphasises the importance of proclamation of the faith. On the other side of the entrance the Eagle Lectern is similarly prominent - emphasising the importance placed on the scriptures in Anglican churches. The Chancel houses the choir stalls. All Saints has a long and proud choral history. There is seating for up to 40 choristers and 3 clergy in the choir. 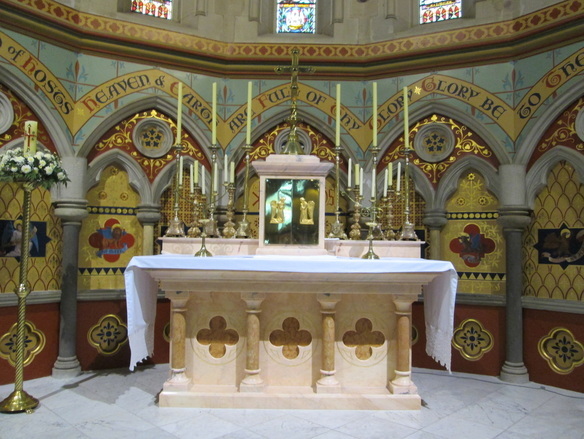 Note the beautiful tiled flooring of the chancel. Note also two superbly patterned clerestory windows in the chancel. On one side of the chancel the pipe organ is housed. Built in 1923, and one of the largest parish church organs in Australia, it was extensively rebuilt in 1982 and is maintained by Australian Pipe Organs P/L. The Chapel of Our Lady is entered from the north transept. This beautiful chapel is the site of the weekday worship conducted at All Saints Church. There is a beautiful small Oratory dedicated to Our Lady of Walsingham and St Michael off the Chapel. Lastly, we come to the Sanctuary, which has the beautiful marble altar with its prominent tabernacle. The prominence of the altar and tabernacle in the church reminds us of the presence of Christ and the centrality of the Mass to our Christian life. The beautiful stencilling in the sanctuary and chapel of Our Lady was recreated when All Saints Church was fully restored inside in 2008.